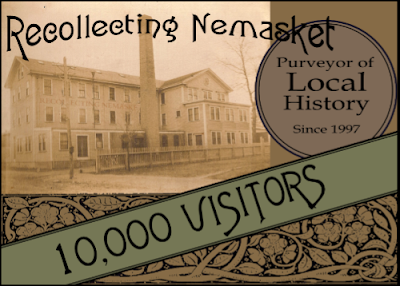 Recollecting Nemasket passed a landmark today with its 10,000th visitor logged to the site. While perhaps a small achievement by the standards of other blogs, folks down at the plant (pictured above where the history for the site is churned out on a near daily basis) are pretty darned please and the staff of over-achievers has been given the day off. 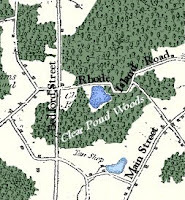 A big grateful "Thank You" goes to everyone who has visited the site and learned just a little bit more about Middleborough and Lakeville history in the process. The most searched labels which have led visitors to the site have been Lakeville State Hospital followed by Chinese sugarcane, Mercy Otis Warren, Ted Williams Baseball Camp, Middleborough Historical Society, and Middleborough Town Hall - an eclectic mix of topics if ever there was one. (Who would have thought so many folks were googling "sorghum" in their spare time?). Other links are even more intriguing. On March 14, a visitor from the UK was linked through searching "zoo bird escapes" on the internet, while a Russian-speaking visitor was directed to the site after searching Улица Пилес, the Russian name for Pilies Street, one of the main streets in the old part of Vilnius, Lithuania. I'm not sure what the connection to Middleborough and Lakeville is on that last one, but большое спосибо all the same, Mr. Russian internet man. Thanks for stopping by! (Благодарию Вас за посещение Recollecting Nemasket). Not surprisingly, traffic comes predominately from the neighborhood of Middleborough and Lakeville (1,845 visits), with Bridgewater, Taunton, Brockton, Boston, Hingham and Stoughton clocking in with several hundred visitors among them, as well. (Honestly, that last one is not me visiting from work). Unlike politics, not all visitors are local. A peek at the world map shows that visitors from 90 some countries have dropped by at one time or another. (In this category, thanks go out to the reader in Seoul, South Korea, who has been visiting regularly. I'm glad you found the site, and hope you find it both informative and enjoyable). A special shout out to the anonymous 10,000th visitor from Temple University in Philadelphia who googled "Lakeville State Hospital" just after midnight and was led to the site. Congratulations, your prize is in the mail. Hopefully the information you found will compensate for your lack of sleep last night. Thanks to all the rest who have taken the time to visit and to read the posts, and much appreciation as always for the regular followers who have provided feedback and new insights. Thanks also to Mark Belanger with his own Bellicose Bumpkin blog and Blog Roundup, the Brockton Enterprise and the Lakeville Public Library who were all kind enough to provide links to Recollecting Nemasket when it was just finding its legs. Because of support like this, Recollecting Nemasket continues its mission to be a local history resource for the community. Thanks for the shoutout Mike. Your blog is an amazing piece of quality work. It sets a high bar indeed in the blogosphere. Howdy from this reader living in Tucson, Arizona. FYI, I found a link to you when I was browsing the history section of the www.tauntonriver.org site. (This desert rat grew up near the Titicut area of Bridgewater.) I second the previous poster's comment regarding the quality of this site. It also has an enjoyable quirkiness as you never know what interesting historical tidbit will be covered next. By any chance do you have any info on the archeological digs that were conducted (1940-50?) along the Taunton River near where it crosses Vernon Street in northern Middleboro over by the Raynham line? Thanks for the positive feedback. It's always appreciated. 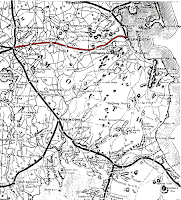 Regarding the archaeological excavations in the Titicut and Fort Hill areas along the Taunton River, the Massachusetts Archaeological Society is the best resource for information. (You can link to MAS through the sidebar here). Bill Taylor of Middleborough was actively involved in the work (owning a portion of the excavated property in Middleborough) and he wrote a number of illustrated articles which were published at the time, including a series about the Seaver Farm excavations in Bridgewater in 1969 which appeared in the Middleborough Antiquarian (the publication of the Middleborough Historical Association) in 1972. These can be purchased from the Historical Association or photocopies might be available through the Middleborough Public Library. Hope this helps! I look forward to your articles every week and take away some great knowledge.